Building science is the collection of scientific knowledge that focuses on the analysis and control of the physical phenomena affecting buildings. This includes the detailed analysis of building materials and building envelope systems. The purpose of building science and understanding the training that supports it is to provide predictive capability to optimize building performance and understand or prevent building failures. Those failures may include not only structural weaknesses but also failures in securing the building envelope against moisture intrusion that may result in wood rot, mold, or, in most severe cases, destruction of the structural integrity of the building. These courses are specifically designed to support the NORMI Certified Durable Builder program but are useful for all interested parties, professionals or clients, who desire a better understanding of the way building should be constructed to optimize structural strength and longevity. For more information on the NORMI CDB, please email support@normi.org for details on that program. NON-Vented Attics- The benefits of have HVAC Systems in conditioned space far outweigh any, if any, added costs and is the best way to insure efficiency of the entire system! Examples of the types of framing to allow keeping ductwork within the building envelope will be discussed in detail. NON-Vented Crawlspaces- Dept. of Energy recommends this approach in our climate! This class will show when and how a crawl space should be vented or sealed. Specifications and cut sheets will be included to show the exact way to seal a crawlspace and save money doing so for both the builder and the owner. 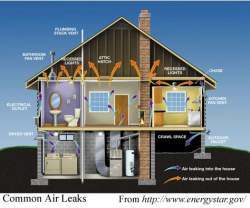 IAQ Basics 101- This class covers the basics of IAQ and the technologies available for solutions. When understanding the seven (7) components of indoor air, it is easier to understand a wholistic solution to IAQ problems and in creating healthier environments indoors. HVAC Systems in Conditioned Space- A discussion of the energy efficiency and improved IAQ that can result from being aware of where duct systems are installed. Too often, poor planning results in ductwork being placed in hotter than necessary chases or attics resulting in increased energy costs and poor air quality from air infiltration into improperly sealed ductwork. Drainage Planes- How water moves across the building envelope and finds wicking opportunities. Rain in one of the most important factors to control in order to build a durable structure. This class will show different types of drainage planes and how they work. We will discuss how materials can vary depending upon the specific flashings used to secure the envelope of the living space. * Insulating the Envelope- This class will cover different types of insulation and how each works. We will explain "R" factors, heat transfer and include a discussion about how heat and cold move throughout the structure. This practical view of insulation will result in more efficient and effective ways to insulate the envelope. * Diagnosing Moisture Problems- Investigating/diagnosing air and water infiltration helps to understand the need for sealed envelopes to avoid potential and future moisture problems. Over eighty percent (80%) of mold problems are a result of ignoring the basics of identifying and fixing moisture problems BEFORE they become a problem or present themselves on the inside of the envelope. Anti-Microbials on Substrates- This discussion covers green water-based anti-microbials and the choice of products available on the market for providing mold prevention, some even have 20 yr. warranties. Construction Glossary- Clients are more familiar with the construction industry than ever before so it is important for the mold professional to understand and use the proper language. Terms correctly used in your conversation with demonstrate your mastery of the industry and suitable describe the work you are accomplishing. IAQ Consultant, owner Environmental Solutions, Inc.